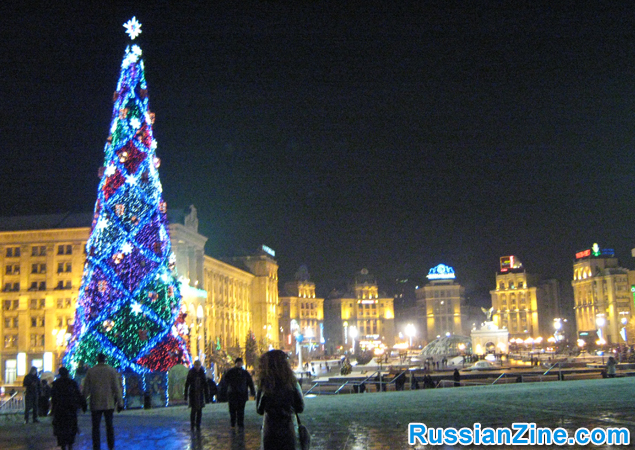 Why Travel To Kiev Ukraine? 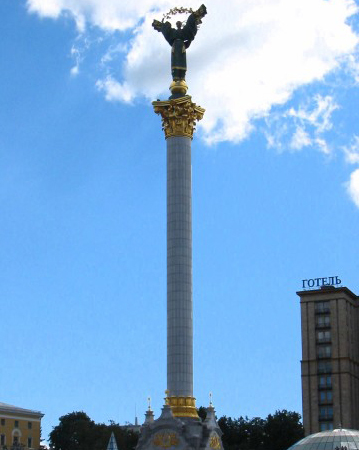 Why Travel to Kiev, Ukraine? WHY VISIT? : The capital of Ukraine, Kiev has everything from world class shopping, to sandy beaches (along the Dnepr river) and enough action for the most demanding nightlife seeker. Kiev’s main international airport is called Borispol. If you know some Russian you can take a very cheap van ride from the airport into the city center, getting dropped off at the train station. From there you can hop the subway to wherever you need to go. Otherwise, you’ll likely pay $35 to $40 for a cab into town. Kiev certainly has it’s share of hotels. The nicest in this writer’s opinion being the Inter-Continental located directly across from Kiev’s cultural heart, its Sophia Cathedral. But the Inter-Continental isn’t cheap. Depending on the season, you’ll pay at least $400/night. Ouch. A far better solution is to rent an apartment in Kiev. You’ll pay anywhere from $40 to $100/night for a nice two-room apartment, usually within a five minute walk to Kreshatik St, the main drag. I’ve never been bowled over by the restaurants along Kreshatik. (Again, Kreshatik is Kiev’s main walking street.) I usually end up at The ПАТИО (Patio) restaurant…an Italian place at the end of Kreshatik. (The opposite end from Maiden Square.) Though the food’s fine, the Patio is about as authentically Italian as the US chain The Olive Garden. For a good meal in Kiev, you’ll need to hop in a cab. One of my favorites is a truly Ukrainian spot called Shekavica, on Kostjantinovskaja 46/52. The décor is 100% Ukrainian, as is the food and the live music. It’s one of those true immersion experiences. My other favorite place in Kiev is Stefano’s Fine Food Factory on 4 Vladimirskaya. Except for the name (Food factory??) everything about Stefano’s is great! The Italian food, the décor, the huge fishtank and especially the service. Neither Ukrainians nor Russians understand the first thing about western-style service (i.e. that the waiter should be friendly and polite, the food delivered promptly, etc). But Stefano’s gets it. You’ll likely want to eat there again. Kiev has an excellent subway system that costs just pennies to ride. It’s worth the time to study a map and figure out how to ride the subway and get where you want to go. The next best option would be a taxi, but as in any big city, the cost can add up. Kreshatik Street: Kreshatik St. is usually closed to traffic on weekends, and that’s when it’s the most fun to take a walk there. There are plenty of shops to explore (mostly clothing), though people watching is perhaps the most enjoyable activity there. Grab a coffee, or a pivo (beer) and get out there and mingle. 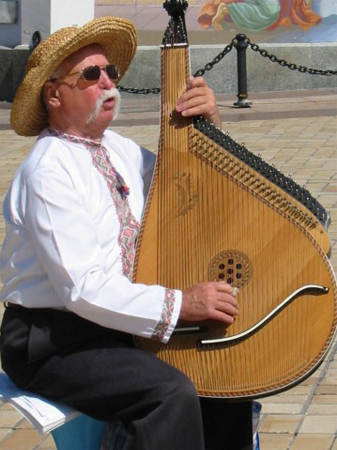 Andrevski Spusk: A “spusk” in Russian is basically a descent. 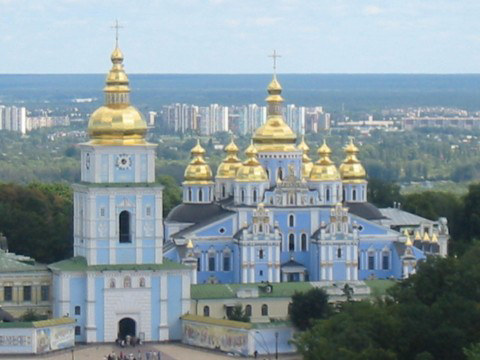 So, Andreivski Spusk is the hill you’d descend from Kiev’s gorgeous Andreev Cathedral. During the day, both sides of the street are lined with souvenir stands and artisans peddling their wares. The green cupolas of the Andreev Cathedral are very photogenic so be sure your digital camera is charged and you’ve got plenty of space on the memory card. Motherland Statue: You’ll probably spot this behemoth silver statue from the plane as you fly into Kiev. It’s ginormous. Funny enough, most Kievites don’t seem to like the statue, so the park is rarely crowded. They say she’s too “masculine” looking. (My take: She’s supposed to look masculine. She’s not a literal woman but a figurative one. 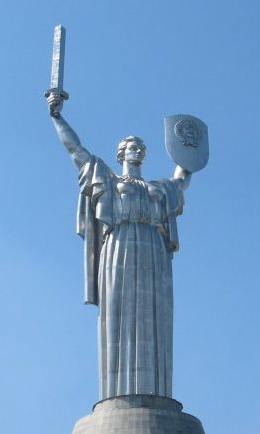 She represents the strong, Ukrainian people who stood up to and defeated the Nazis.) There’s a great museum inside the base of the statue, but I wouldn’t call it a must-see. 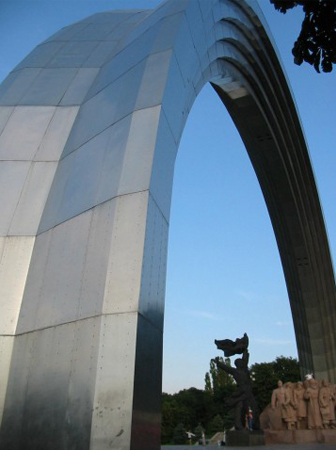 But the trip to the statue and the surrounding park most certainly deserve a visit. The Ocean Mall: The Ocean Mall is one of Kiev’s newest and ritziest shopping malls. It’s new, clean, big and expensive, but worth visiting if only for the shark tank. Dream Town Mall: Kiev’s Dream Town Mall is another one of its newest malls, and worthy of mention alongside the Ocean Mall. 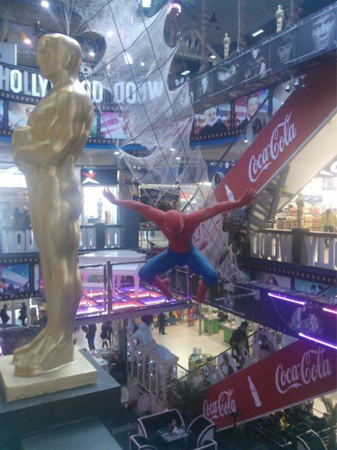 Dream Town Mall has a very different feel, seeming to be aiming at kids with its huge props of Spiderman and King Kong, and themed shopping areas. If you insist on partying as close as possible to Kreshatik, then I’d recommend the Arena Entertainment Complex, at 2A Basseinaya Street. It’s basically at the Besarabski Rinok. Can’t miss it…it’s a huge complex. There’s something for everyone there amongst its four floors. A brewery, a sports bar, dance clubs, etc. If you have two nights in Kiev, go here on your second one. You can read all about it here: http://www.arena-kiev.com/en But be prepared for Face Control in most of Kiev’s upscale clubs. Go HERE to read about Face Control. 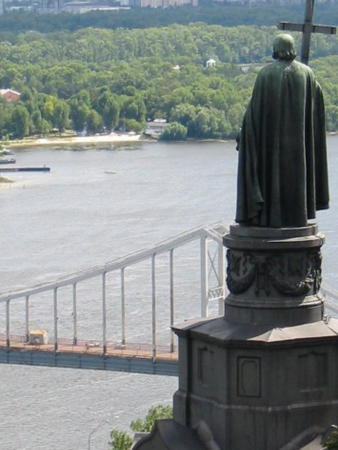 OFF THE BEATEN PATH: I have two suggestions to get off the beaten path in Kiev. And they are polar opposites of one another. 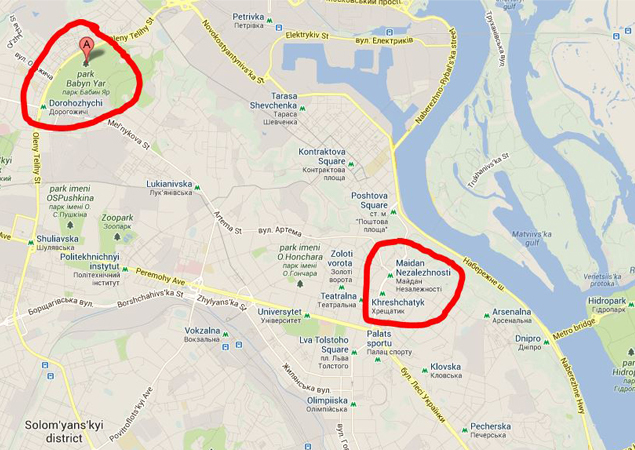 First is Babyn Yar, in the northern part of the city. Since the directions there are complicated, I’m including a map to show you where it is in relation to Maiden Square and Kreshatik. Babyn Yar is a memorial to 100,000 Ukrainian Jews who were essentially buried alive in a ravine there. The memorial itself is ghastly and overwhelming: A statue depicting people plummeting into the pit. Is it a glamorous place? No. Is it worth seeing, to pay your respects and remember what kind of world we’re a part of? Absolutely. And the suggestion off the beaten path? Head back to the Hydropark and search for the huge, free, open air gym. It’s a sight to behold: All the devices were made from scrap metal. You’re essentially bench pressing automotive parts. You’ll never see another gym like it. Previous: Why Travel to Odessa Ukraine? Next: Why travel to Sevastopol Ukraine? 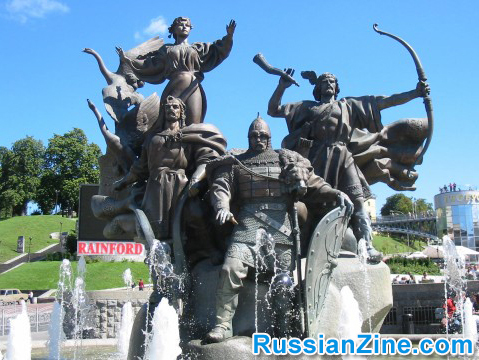 Why Travel To Western Ukraine?